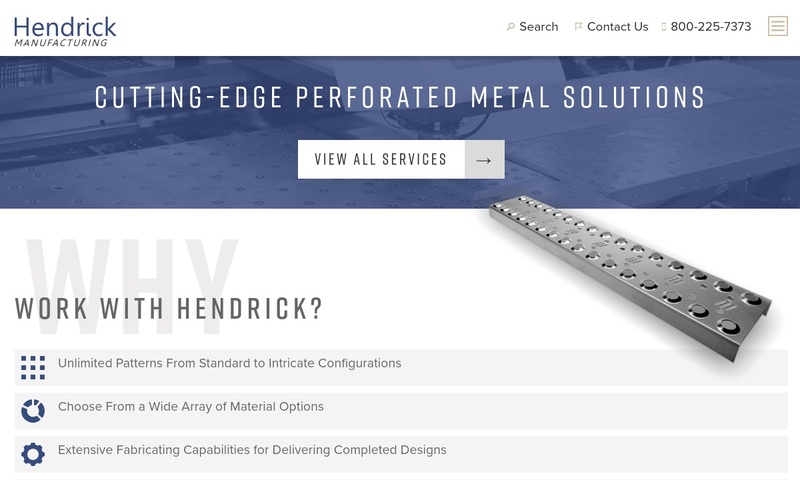 A reliable source for Perforated Metals information and a resource for accessing leading Perforated Metals and suppliers. Perforated metals are metals that have been punched, or perforated, with various shaped holes in a series or a pattern. Perforated Metals Perforated metals are metals that have been punched, or perforated, with various shaped holes in a series or a pattern. 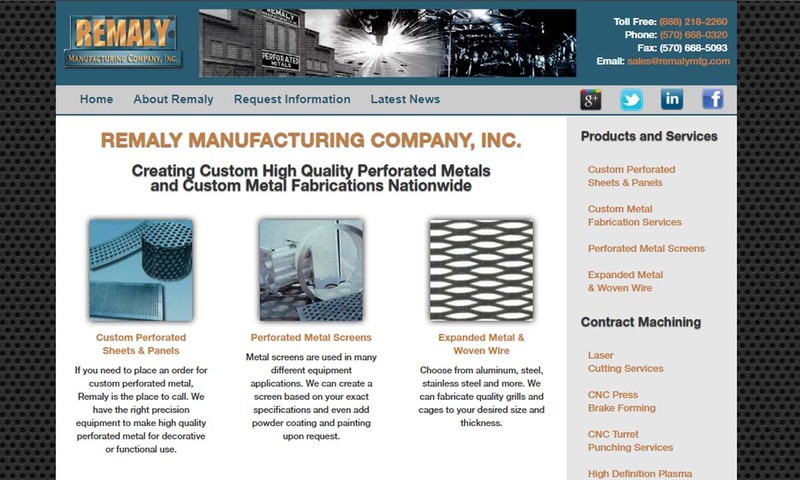 Remaly Manufacturing is a leading perforating & fabricating manufacturer, established in 1865. 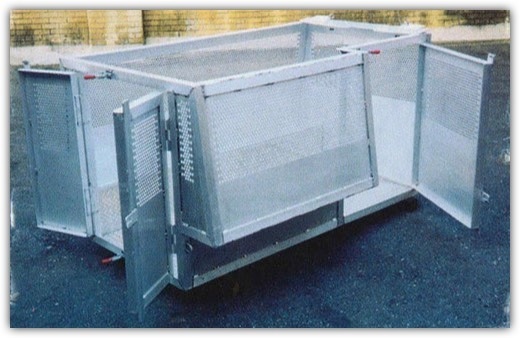 We provide perforated aluminum, perforated plate, perforated steel, perforated brass, screens & bar gratings. Here at Astro Engineering & Manufacturing we are striving to provide the best perforated metals. The capabilities of our engineers are unmatched. These products are ideal for various industries. 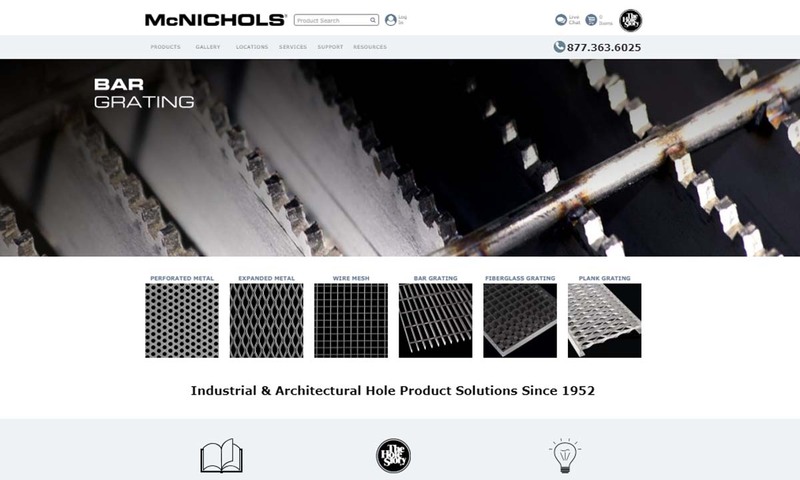 McNichols is a manufacturer of perforated metal sheets and screens as well as perforated gratings, floor gratings and filter screens. We have a selection of round, square, slotted, hexagonal and decorative designs. We are metal perforators with capabilities to produce unlimited patterns from standard to intricate configurations in round, square, oval and rectangular shapes. 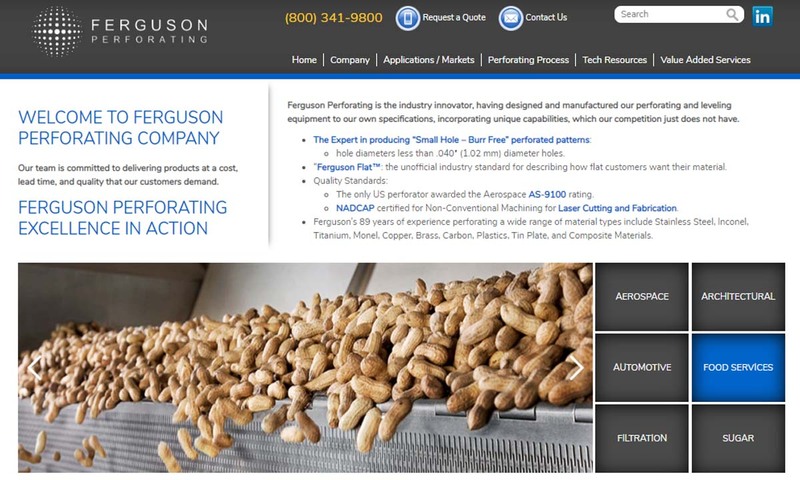 For perforated metals of stock and custom products, Ferguson Perforating is able to produce standard hole sizes plus special sizes from 0.020"-2.25" diameter and hexagonal, square or slotted perforations. 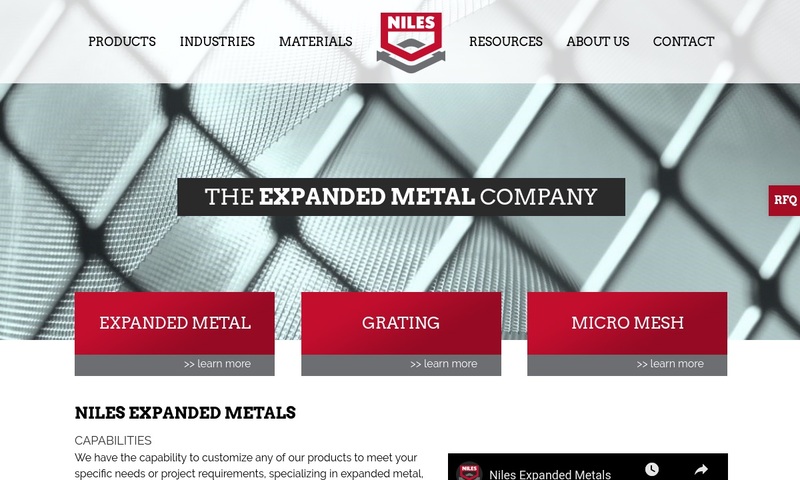 Niles Expanded Metals & Plastics is a leading manufacturer of “Experf”, The Experforated Metal. It is expanded metal, not punched, and raw metal usage can be reduced up to 50%, resulting in significant reduction in cost. Perforated metals are used in interior and exterior design manufacturing applications (both functional and decorative). Industries that make use of perforated metals include filtration, insulation, security and barrier, construction, furniture, acoustics, material development, automotive engineering, chemical and energy, food service, waste management and automotive engineering. The number one industry for perforated metals is architectural design. Perforated metal providers get requests for a wide variety of perforated sheet metal products. Some of the most popular include: panels, filters, strainers, wire mesh baskets, tubes, piping inserts, trash cans, vents, speaker covers, access restriction screens, light fixtures and patio furniture. Within the various industries to which they cater, service providers create even more in-depth and complex products. For example, in food and beverage, perforated metal fabricators make products such as: man-made beehives, fish screens, wine vat screens, silo ventilation screens, cheese mold screens, grain dryers and perforated metal mesh strainers. Meanwhile, in acoustics, common perforated metal products include protective covering, sound absorbers and airflow diffusers. Some of the most common architectural products include: column covers, panels, signage, fittings, cladding and sunshades. Chemical and energy products include: washing machine drying baskets, gas screens, air purifier screens, water screens, centrifuge screens, battery separator plates and coal washing cages. Example perforated metal products for material handling and development include: cement slurry screens, blast furnace screens, textile printer parts, glass reinforcement and cinder screens. Finally, in the automotive industry, perforated metals are used to make automobile components such as: silencers, grills, air filters, oil filters, ventilation grids and running boards. 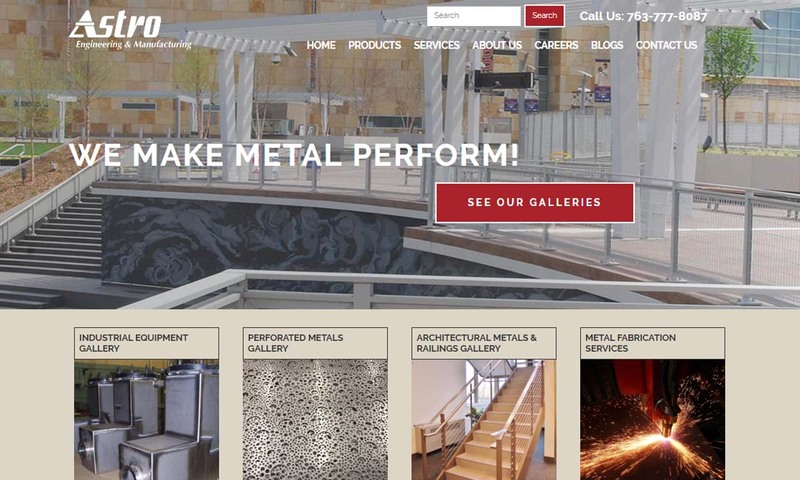 Perforated Metal – Remaly Manufacturing Company, Inc.
Perforated metals have a long history as decorative and artistic elements in residences, palaces, governmental offices, etc. Perforated metal was also used in societies of antiquity for various applications, from coinage marking to filtration. They have been around as long as metals have been known; before then, various ancient cultures used other perforated materials for their purposes. Metal perforation really took off in the ancient world when hand-to-hand combat and metal usage intersected. When this happened, cultures like the Sumerian civilization started making densely perforated helmets. Perforated metal was subsequently used for other warfare accessories, like medieval perforated plate armor. While metal perforation was a widespread service, for many years it was an imprecise and time-consuming one. This all began to change around 1615, when the industrial rolling mill was introduced to artisans. This allowed them to begin making and using industrial sheet metal, which was more uniform in material thickness, length and width than anything they’d worked with before. Using this new medium, they were able to develop more modern metal perforation techniques and processes, such as folding, shearing and forming. The biggest shifts came a few hundred years later, during the Industrial Revolution. At this time, perforated metals had become popular for a new application—perforated metal screens for sifting and separating coal. This industrial application required that the screens be created at a higher rate, and more durably. After struggling to find a way to economically and efficiently create perforated screens, a Michigan native developed the metal punching press around 1876. This machine allowed him to punch several holes into the thick metal he used simultaneously. From this early model the modern perforating punch would emerge. Then, in the 1880s in the United Kingdom, engineers determined how to expand metal, which advanced the industry by offering a no-waste method of perforation. Throughout the 20th century, as technologies continued to morph and expand, manufacturers were able to create more complex and unique perforated metal products. They relied on new perforated metal process machines, like custom presses, rotary pinned perforation rollers and laser perforation. Today, metal perforation is more consistent and efficient than ever. The industry has become incredibly lucrative, assisting in 21st century applications from environmental impact to advanced aerospace. Perforated metals may be made from a number of metals; the decision of which is mainly determined by application requirements, like heat resistance, erosion resistance, hardness, etcetera. Metals and alloys that are commonly perforated include copper, zinc, carbon steel, stainless steel, aluminum, brass, titanium and others. Read on to learn a little more about each. Copper offers metal perforators a wide variety of benefits. First, it’s an excellent conductor of both electricity and heat. Second, it’s rust resistant and effective in a wide range of temperatures. Finally, it has a lovely reddish tint that lends it to decorative applications. Because of its versatility, perforated copper is commissioned for a wide variety of applications, such as shielding, tubing and exterior and interior design. Zinc is a fairly inexpensive metal that is resistant to chemical corrosion and some acids. In addition, it lends itself well to welding. It is especially effective when perforated for filtration purposes. Carbon steel, also known as mild steel, is a durable material with great corrosion resistance. It is generally available in plain, cold-rolled and hot-dipped galvanized finishes. Perforated carbon steel is popular for a wide range of perforated metal applications. These include: washing machine drums, dishwasher drums, sidewalk furniture, car grilles, display stands and shop fittings. Perforated stainless steel, like all stainless steel, is lightweight, durable, antibacterial, rust resistant and corrosion resistant. Available in 15 different grades, it has something to offer in nearly every industry. Perforated stainless steel is particularly useful in pharmaceuticals, healthcare and food and beverage industries, as they are easy to keep sterile. Service providers turn to aluminum for its: durability, rust resistance, heat resistance, corrosion resistance and strength. Aluminum perforated metal is popular for use in applications such as: stairways and railings, decorative partitions, office refurbishment, car grilles, MEMS (Micro-Electro-Mechanical Systems) capacitive microphones, display stands, interior designs and wall panels. Brass is another aesthetically pleasing metal. It is a shiny, gold-ish alloy made up primarily of copper and zinc. In addition to being attractive, brass is thermally conductive, electrically conductive and resistant to tarnishing. When alloyed with aluminum, it becomes more corrosion resistant. All in all, perforated brass is popular for applications in electronics, HVAC, architecture and interior design. Perforated titanium is the strongest metal available to most metal perforators. Yet, it is 40% lighter than steel. It is also quite resistant to corrosion. For these reasons, it makes an excellent material for the production of perforated sporting good and aerospace products, as well as products related to: prosthetics, desalination, marine hardware, chemical processing, valve and pump parts and power generation equipment. 2. Choose material sheet gauge. Sheet metal thickness is measured by the gauge. The larger the gauge, the thinner the material. 3. Choose/design a perforation pattern. 4. Perforate the sheet metal via bending, welding, punching, cutting, etc. Sheet metals perforation is performed using two likely methods, depending on the repetitiveness, complexity and general design of the hole patterns. Simple perforations may be fabricated using a standard punching press, which is a large press containing whatever hole pattern the manufacturer requires. To achieve the desired perforation, sheet metal is simply fed through the press, which punches it. For more complex perforation designs, like decorative panels that use many non-repetitive shapes, manufacturers use a sectional XY axis punching press. This press is usually CNC controlled, thus ensuring precision and accuracy. 5. Perform any finishing processes. Examples include: grinding, brushing, rounding, degreasing and surface polishing. To provide the most effective perforated metal services, manufacturers consider a number of different factors. First, they think about what perforated metal pattern(s) might be best for your application. For example, if designing for an audio application, manufacturers will consider sound transparency. If you’re seeking high sound transparency, your perforated metal provider will design a series of perforations with a large open area. Likewise, if you seek low sound transparency, they’ll design perforations will a smaller open area. Other things they will take into consideration when designing and/or customizing perforated metal products are: space restrictions, safety standards and regulations, industry standards and time constraints. Wide punching presses offer quick and inexpensive perforation. They feature a die and one or more punch rows that strike the metal plate as it moves through the machine. With each strike, it punches the entire width of the plate. Manufacturers can modify die and punch row patterns in order to create custom perforated metal products. Because the machine works so quickly, it is easy to find stress faults in the perforated part. To rectify this, metal perforators often use a leveler. This removes stress errors by flattening the plates. The main drawback of this perforation method is that is has a high tooling cost. To perforate using the XY press, sheet metal is secured to the machine and slowly moved around underneath one to several stationary single-shaped punching rams, which create a detailed perforated pattern on the metal as it moves in the direction of the hole design. This process is long, but patience rewards the metal worker with complex, precise, decorative perforated sheets and perforated metal panels. Though both manual and CNC punching methods have their merits, CNC punching tends to be preferred due to lower labor costs, higher production speeds and greater process repeatability. In addition, using CNC equipment, it’s easy to create custom programming. Automatic nibbling machines are quite similar to sectional presses, in that they work on just one section of plate at a time. Unlike sectional presses, though, their production, including perforation tool changes, is automated. They create perforations by nibbling contours. Automatic nibbling machines offer affordable perforating and good outer plate finishing. Like all perforating equipment, they can create custom features related to: strength-to-weight ratio, open area, hole diameter (measured in mm) and hole size (measured in mm). Metal expansion is a process that creates metal with hole patterns by cutting or stretching them into a shaped framework. Expanded metals are desirable because they create little to no waste and they are inexpensive. In other words, they’re all around sustainable. They can be used for many of the same applications as perforated metals, including: filtration, enclosing, structural support, decoration and reinforcement. However, metal expansion cannot create holes as fine or as intricate as metal perforation. Laser perforation is a modern perforation technique. As its name implies, it involves the use of lasers. Laser technology offers extreme precision without stress, high consistency and virtually endless possibilities. However, the process is rather expensive. So, it’s best reserved for the most important and precision-reliant applications. This alternative perforation process is known for its efficiency and cost-effectiveness. It employs a rotary pinned perforation roller, which is a large cylinder lined with sharp, pointed needed. As metal sheets move across the roller, the needles punch holes of varying diameters into them. Sometimes, to reinforce the perforations, manufacturers heat the needles. This causes the metal to melt and form a hollow ring around the needle hole. To customize hole sizes and patterns, manufacturers swap out needles. A final variation is die and punch perforation. During this procedure, manufacturers put sheet metal in between a die and a press. The latter pushes the sheet into the die, which punches it. The press may be hydraulically or mechanically driven. This process requires shearing to remove leftover material and smooth the surface after punching. Perforated metal services offer so many stand-alone and “as compared to” benefits. First, perforated metals and generally lightweight and easy to transport and handle. Second, they’re incredibly versatile, more so than competitors like expanded metal. Likewise, they can be produced with unmatched precision. In addition, they are extremely functional and feature incredible strength and structural integrity. They’re also sustainable in a number of ways. For instance, old perforated metal components, scraps and leftover metal from production can be recycled and refurbished. Also, unlike others, old acoustic perforated metal sheet can be cleaned and refurbished without damage to acoustic equipment absorptive properties. They additionally provide great energy savings to the architectural industry—When integrated in a building facade, they account for an energy savings of up to 25%. As you’ve likely noticed, the market is flooded with perforated metal sheet manufacturers, all eager to get your business. This can make it quite hard to discern one from another. Which one is best? We believe that the best, and right, service provider is not the one that presents the flashiest offer, but the one that demonstrates they want to create for you the highest quality and most well-matched product possible. To help you find “the one,” we’ve put together a list of those perforated metal manufacturers and suppliers we’ve learned to be the most knowledgeable, creative and reliable.  Learn all about them by scrolling up and checking out their profiles, which is displayed on this page.